Surrounded by palm trees and the white-sanded beaches of Puerto Villamil, La Casa de Marita offers stylish accommodations in beautiful Isabela Island. Free Wi-Fi and buffet breakfast are included. This boutique hotel features suites with private balconies and ocean or interior views. All of them are decorated in unique contemporary artistic styles and are fully equipped with air conditioning, minibars, and comfortable seating areas. La Casa de Marita's restaurant serves both national and international dishes made only from fresh, organic, ingredients entirely grown and harvested in Marita's plantation. Guests can relax on the hammocks overlooking the sea, or enjoy themselves reading a book from the library. Many outdoor activities, such as snorkeling and hiking trips, can be requested at the hotel. La Casa de Marita can be reached by plane from Quito and from Guayaquil. Santa Cruz (Puerto Ayora) is 2 hours away by boat. Sierra Negra Volcano is 14 miles away. The Giant Tortoise Center is one mile away. Hotel San Vicente Galapagos is located on Isabela Island, the largest of the Galapagos Islands, 500 metres from the beach. It offers air-conditioned guest rooms, and free use of snorkel equipment. The bright rooms at Hotel San Vicente have an en suite bathroom with shower. Each one is also equipped with a TV set. Hotel San Vicente Galapagos’ restaurant, which serves breakfast, lunch and dinner, offers traditional Ecuadorian cuisine. Excursions to see the Galapagos sharks and sea lions can be arranged by the on-site tour desk. Airport transfers can be arranged with the hotel. Hotel reception is open 24/7, and free Wi-Fi is provided in public areas. Right in front of Puerto Villamil beach, Cormorant Beach House offers rooms with air conditioning and a sea view. There is a terrace overlooking the ocean. The town centre is 100 metres away. Rooms at Cormorant Beach House boast panoramic views of the sea. They feature tiled floors, minibars, and TVs. Breakfast is daily served. Guests can enjoy splendid sunrises over the ocean and take a stroll along the beach as the sun sets. The turtle farm is 5 km away. Local transfers are offered from the hotel to Isabela Island's pier or to Isabela Island's local airport. Just a 2-minute walk from Playa Ancha Beach, this family run beach resort in Galapagos Island boasts an outdoor swimming pool and rooms with views of the garden. Wi-Fi is free. Diving and snorkelling trips are available. The Wooden House Hotel is only a 10-minute walk from the pier. Guests can enjoy horse-riding excursions, fishing trips and relax under the shade of the palm trees. Rooms at the Wooden House are fitted with air conditioning and feature rustic décor. There are wood furnishings and accents of red. Some rooms have delicate wall drawings. All rooms have work desks and bathrooms with showers. An American breakfast with tropical fruits and treats can be enjoyed daily at the outdoor seating area overlooking the pool. The Wooden House Restaurant features local flavours and International cuisine. There are lava rock BBQ facilities. The hotel is a 5-minute drive to Concha de Perla. Bicycle rental can be arranged. Featuring a garden and a hot tub, Hotel La Laguna Galapagos offers rooms with plasma TVs in Puerto Villamil. There is a restaurant, and breakfast is served. Playa Grande Beach is 500 metres away. Rooms at La Laguna Galapagos have private bathrooms with hot water, air conditioning, and plasma TVs. Some of them afford panoramic views of the Sierra Negra Volcano and Flamingos Lagoon. A continental breakfast including coffee, tea, natural juices and butter is served daily. La Laguna restaurant offers local specialties and fine drinks. BBQ facilities are featured. Guests can relax in the lounge or enjoy themselves in reading area. Local animal species such as flamingos, giant tortoises and sharks can be watched in their natural environment. Hotel La Laguna Galapagos is located in front of the Flamingos Lagoon and 5 km from the dock. Baltra National Airport is 4 hours away by boat. Featuring a garden and a terrace, this guest house is 80 metres from the beach of Puerto Villamil. All rooms have scenic views. The rooms at La Gran Tortuga include a private bathroom, air conditioning, a seating area, minibar, and TV. Room service is provided. At La Gran Tortuga, breakfast is served daily. The 24-hour front desk can arrange laundry, dry cleaning and ironing services, and the tour desk can arrange bicycle rentals. Wi-fi is available in public areas and is free of charge. The Moon Malecon is 100 metres from the hotel and Jose de Villamil Airport is 2 km away. Located right in front of the beach, El Hotel Casa Isabela offers air conditioned rooms in paradise-like Isabela Island, in Galapagos, only 100 metres from Puerto Villamil city centre. With large windows overlooking the Pacific Ocean, rooms at Casa Isabela are bright and spacious. They feature air conditioning and a private bathroom with a hot shower. An American breakfast is served daily at the cafeteria. Guests can unwind on the hammocks or on the common rest chairs featured in the garden. Set in a Mediterranean-style house located right on Cuna del Sol Beach, Hotel Albemarle features a garden with a pool and a restaurant. It offers air-conditioned rooms with free Wi-Fi in Isabela Island. Decorated with tiled floors and wooden roofs, rooms at Albemarle Hotel are fitted with stylish furnishing. All of them have cable TV, DVD players and private marble bathrooms. All of them afford either sea or pool views. A buffet breakfast is served daily. Seafood specialties can be enjoyed at the property’s restaurant. A common BBQ area is featured. Guests can relax on the sun loungers by the pool or on the hammocks available in the garden. Excursions and diving activities can be booked at the tour desk. Hotel Albemarle is a 2-hour boat trip from Santa Cruz and 3 km from General Villamil Airport. Comfortable rooms with free Wi-Fi and garden views can be enjoyed on Galápagos Islands. Hostal Loja offers a charming natural environment with hammocks and is only 300 metres from Puerto Villamil Beach. Hostal Loja has rooms with tasteful décor and private bathrooms with showers. Some of them feature air conditioning and private balconies. A full breakfast with tropical fruits, eggs and bread is offered daily. Drinks can be enjoyed at the bar. Loja is only 1 block from Puerto Villamil’s main street and 200 metres from Galápagos National Park. The tour desk can offer tips for getting around the area. Practical rooms with free Wi-Fi are offered on Galapagos Island. 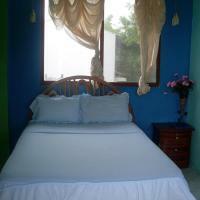 Posada del Caminante is 100 metres from the town’s market and 4 km from Tomas Volcano. Guests can make use of a shared kitchen and help themselves to complimentary fresh fruits. Del Caminante has rooms with TV, refrigerators and shared bathrooms with hot water around the clock. Some rooms include kitchen facilities. Laundry services are available. There is 24-hour front desk assistance and Seymour Airport is 30 km away. Located 300 metres from Playa Grande de Coral beach and from the main square, Hostal Sula Sula offers free Wi-Fi and rooms with private bathrooms in Puerto Villamil. The en suite rooms in Sula Sula feature cable TV, showers, air conditioning and lava field views. Room service is available. Guests can rent bicycles, surf boards and tents, and snorkeling activities can be arranged in the area. Hostal Sula Sula is 1 km from Embarcadero Pier and from José de Villamil Airport. Located 50 metres from the city centre and from the beach, Casa Los Delfines offers free Wi-Fi and breakfast in Puerto Villamil. Tours to explore the islands can be booked at the hotel. The rooms in Los Delfines feature cable TVs, private bathrooms with showers and air conditioning. Guests at Casa Los Delfines can relax in the garden or in the terrace. A common living area with a TV is featured and free Wi-Fi is available in public areas. Casa Los Delfines is 1,5 km from José de Villamil Airport. Located 150 metres from Cuna del Sol beach and 10 metres from the commercial area, Hostal Cerro Azul features a garden and an outdoor seating area with hammocks. Free Wi-Fi is available in public areas. 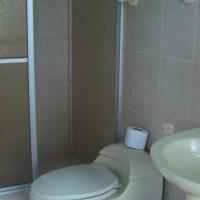 The rooms in Hostal Cerro Azul feature private bathrooms and air conditioning. Guests at Hostal Cerro Azul can enjoy the indoor seating area with a TV or request tourism information at the tour desk. 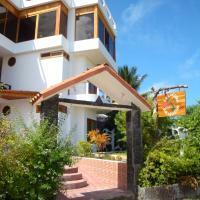 Hostal Cerro Azul is 1 km from Jose Villamil airport. Featuring a garden, La Jungla offers rooms with air conditioning in Galapagos, only 50 metres from the beach. There are common kitchen facilities. Free parking is provided. With large windows overlooking the sea, rooms at La Jungla are fitted with TV sets. All of them have private bathrooms. Guests can cook their own meals in the common kitchen. La Jungla is 400 metres from Tortugas Gigantes Park and 200 metres from the commercial area. Puerto Villamil is 1 km away. Only 300 metres from the beach, Hostal Insular offers rooms with free Wi-Fi and air conditioning in Galapagos. It features a restaurant. Jose de Villamil is 3 km away. Decorated with tiled floors and lively-coloured bedspreads, rooms at Insular are fitted with TV sets. All of them have private bathrooms. An American breakfast is served daily. Regional dishes can be ordered at the property’s restaurant. Comfortable rooms with free Wi-Fi are offered in Puerto Villamil, on Galápagos Island. Guests are greeted with welcome drinks and there are free shuttles to the pier or to Balta International Airport, a 10-minute drive. Hospedaje Las Fragatas feature air-conditioned rooms with private bathrooms and hot water. All rooms are equipped with safety deposit boxes. The Wall of Tears is a 15-minute drive from Las Fragatas and the tour desk can offer tips for getting around the area. This eco-lodge surrounded by garden features fully furnished apartments with plenty of light on Isabella Island. Guests can dive and snorkel in Concha y Perla, 400 metres from Chez Manany Ecolodge. General Villamil Beach is a 5-minute walk. Chez Manany Galapagos Ecolodge features a waste water disposal treatment and is solar powered. Apartments feature kitchen facilities that include kitchenware and are fitted with iPod docking stations, DVD players and comfortable living room areas with sofas. Las Tintoreas Bay is 500 metres away, sharks and sea lions can be spotted there. General Villamil downtown area is a 10-minute walk and the city airport is 2 km away.